Cleaning your refrigerator and staging it may seem like an unnecessary chore, but many home buyers will be opening the door to look inside to see if there's enough room for all their things! 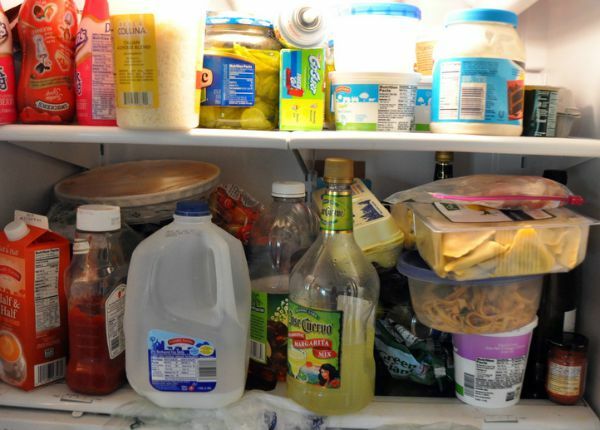 Look into anyone’s fridge and you will find a hodge podge of items crammed into every available space, with stacked containers teetering dangerously and ready to hit the floor. Guaranteed NOT to make a good impression on home buyers! The same is true of the freezer section, as well. I have had an avalanche of frozen meat slide out of my freezer on more than one occasion. Your refrigerator should smell great as well-- don’t let home buyers open the door to the smell of spoiled produce and unidentified containers of what was once edible food. Home buyers will immediately form a bad impression and doubt the cleanliness of your kitchen and home. Start by turning off the refrigerator. Remove everything, tossing food that has gone bad, condiment jars that are almost empty, and anything that has expired. I always find at least one product that I purchased once to try in a new recipe and never used again. Once everything is out, remove all the drawers and shelves for cleaning. Before you do this, try to memorize how it looks and the order in which you removed them. Or, snap a picture of it with your cell phone. Some refrigerator’s are a bit like putting a puzzle together. This will help when you put it all back in after cleaning. Wash everything in warm water and dish soap. For really smelly drawers, use a solution of baking soda and water, or vinegar and water. Often you will find sticky residue from food leakage at the bottom of your fridge. Take a soapy sponge and squeeze warm water on these areas and let it sit for a while to loosen the gunk. Repeat until it wipes clean. Wipe down the entire inside of your fridge with a soapy sponge. Rinse with clean water. If a bad odor persists, wipe the inside with a solution of vinegar and water. Don’t worry, the vinegar smell will go away. When staging your home for sale, you will need to get rid of the art gallery on the door of your fridge. Doing this will greatly reduce the cluttered look and add to your kitchen decor. 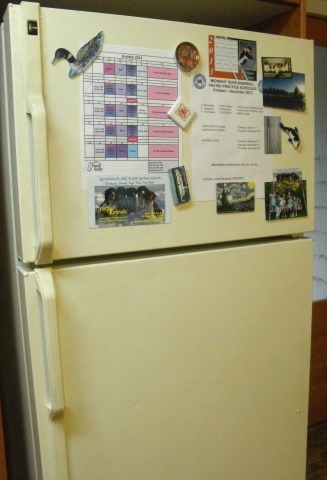 Remove magnets, calendar, children's artwork, and photos, and pack them away for the fridge in your new home! Don’t forget about the top and the outside of the fridge. Your refrigerator should be gleaming and free of fingerprints and smudges when home buyers come over. Remove gummy residue left over from stickers with “Goo Gone” Remover Spray Gel. This gel will remove a multitude of gooey problems like, gum, crayons, stickers, wax, tape residue, makeup, glue, tar, etc. It is all organic and contains no harsh solvents. Goo Gone is available at any home improvement stores. Don't let prospective buyers find your stainless steel refrigerator pock-marked with fingerprints! There are plenty of quick and easy methods to keep you fridge shiny and clean. 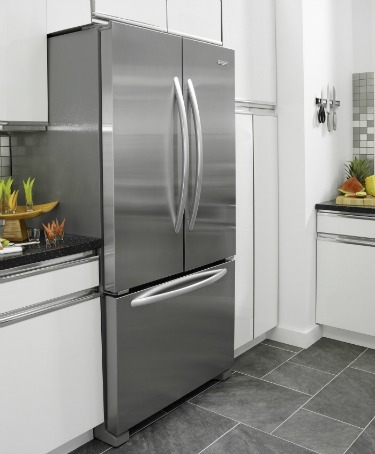 Keep your stainless steel refrigerator shiny and clean! Water and a microfiber cloth work great for a quick wipe down. For removing food crud, use dish soap and a microfiber cloth. Always wipe your stainless steel refrigerator dry to prevent spots and streaks. Windex is a cost effective home remedy for cleaning stainless steel; spray on a fine mist, wipe in circular motion, rinse off and dry with a microfiber cloth. I find that Windex works just as well as the more expensive stainless steel cleaning products. My all-time favorite stainless steel refrigerator shine enhancer? Rubbing alcohol and a microfiber cloth. I use this on all my stainless fixtures throughout the house. The alcohol leaves a brilliant shine, in addition to disinfecting the surface. Always dry stainless steel surfaces after cleaning. If you have hard water, spotting may occur, so wipe stainless steel surfaces with a cloth dipped in white vinegar, then dry with a soft cloth. Spray the exterior with a degreasing cleaning product. Why a degreaser? Because grease floats around kitchens, building up on the outside of kitchen appliances. Wipe down the surface with a damp sponge. Repeat, if necessary. Rinse with clean water, then buff dry with a lint-free cloth. My favorite cleaner for grease and grime is "Johnson Bathroom Scrubbing Bubble Bathroom Cleaner." Just spray on, then wipe off. Rinse with clean water, then dry with a soft lint-free cloth. Repeat for hardened on grease. For an affordable cleaner, mix a teaspoon of dishsoap with 2 cups of water. Pour into a spray bottle for easy use. Spray on fridge, wipe with a damp sponge or rag, rinse, then dry with a lint-free soft cloth. One of the easiest ways to clean a textured fridge, (and they are not easy to clean once the grime sets in) is to spray with... yes, once again! “Johnson Scrubbing Bubble Bathroom Cleaner.” Let it set for the required time, then wipe clean with a damp sponge. Rinse clean and dry with a cloth. The "Mr. Clean Magic Eraser" works really well on textured surfaces. (And so many other things!) Be sure to rinse fridge surface with clean water, then dry after using the eraser. Why should you bother to home stage the inside of your fridge? Because home buyers WILL peek inside. Buyers love organized kitchens, and finding the interior of your fridge clean and staged will really impress them. They will assume that since the fridge is in such great shape, the entire house must be also! Sort food into categories, putting like items together. Keep fruit in one drawer, veggies in another. If you have a third drawer, put your meat or cheese in there. Organizing your food into groups will ultimately save you time when you are looking for something. Clean up any spills immediately before they have a chance to harden and smell. And don’t forget to put an opened box of baking soda at the back of your fridge to absorb odors. 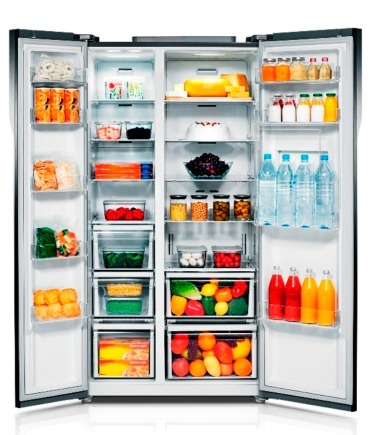 Try to keep spaces between food items in your fridge to give the illusion of more space. I know this is difficult, especially when you have a family to feed. Instead of shoving your left-overs in the fridge in a pan, put them into a smaller, more attractive storage containers. As with the inside of your cabinets, "face" your products so that the labels face the front. They will look neat and well organized.